So, What’s in a Name? A note from our CEO. Sticky Jewelry opened for business in the fall of 2000. Our first product was an engravable photo pin that could hold a Polaroid i-Zone photo. The Polaroid i-Zone camera had just made its debut, and our intention was to create jewelry and accessories that could hold the small-format photos it produced. The original Polaroid i-Zone film had a peel-off sticky back, so you could ‘stick’ the photo anywhere you wanted. We had considered several names for the company, but ‘Sticky’ was the most popular, so we named the company Sticky Jewelry. Well, the i-Zone camera didn’t turn out to be as successful as Polaroid had hoped. It didn’t keep Polaroid from going into bankruptcy, and it didn’t result in many orders for our i-Zone accessories. So, our company shifted its focus away from photo pins and concentrated instead on unique, personalized jewelry. We began offering lockets, and added photo keychains, bracelets, trendy wrist lockets, and a wide assortment of gift items that could be engraved. 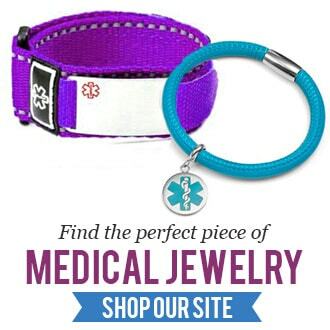 We also began developing a line of fashion conscious medical id alert bracelets and medical alert jewelry. Sticky Jewelry quickly became one of the top personalized jewelry resellers on the internet. We combine quality and affordability with fast turnaround, flat-rate shipping, unbeatable customer service, and a 30-day money back guarantee. Over the past year alone, hundreds of customers have responded to our customer feedback surveys to tell us that their buying experience was clearly superior to what they’d experienced elsewhere, that they would definitely shop with us again, and that they would recommend us to others. We’re delighted to get that kind of feedback. Pleasing customers is what business is all about, and we intend to never lose sight of that fact. The topic of changing our name comes up often at management meetings. But, so many customers have now come to know us by our unusual name that changing it seems to pose a bigger problem than keeping it. The Sticky name seems to help people remember who we are, and they do keep coming back. Like it or not, the name Sticky Jewelry has already ‘stuck’. If you are not yet a Sticky Jewelry customer, we hope that you will come and shop with us and discover for yourself that although our name is a bit strange, the jewelry and gifts we sell and the service we deliver is truly exceptional. I haven’t been back to your site in many years! Great update! Our son was dx with Type I in 1998 & we have used your company often. I would say it is the BEST. Thank you for your products and for your caring attitudes. Hi, Mary Beth. Thanks for your kind words. It’s great to hear from you again. Hi, Janet. Thanks for asking. Yes, we still offer non-medical jewelry. All of our personalized jewelry items are available at Thoughtful-Impressions.com. Confident Ordering- Why StickyJ Customers Love to Shop!